This young lady has really loaded up her cargo bike with the maximum shopping capacity! In light of our participation in the upcoming holiday shopping event, SHOP – RIDE – NELA, we wanted to make sure everyone was totally ready to saddle up on their bicycles to go shopping! Whether you need to pick up a few items at the grocery store or want to meet up with a friend at a neighborhood cafe for a day of brunching and shopping, arriving on a bicycle is a great way to go! Shopping by bicycle is an easy way to run local errands, making your daily routine fun and active without leaving that nasty carbon footprint you would if you were driving. 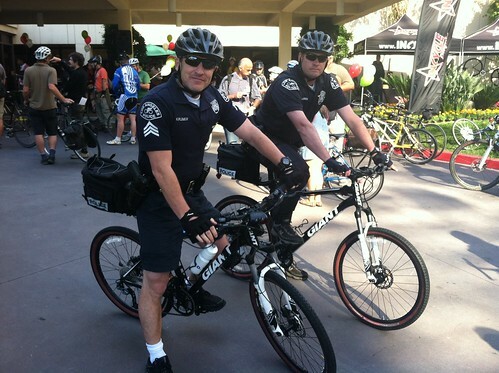 On a bicycle, you can make multiple stops on your trip without having to keep track of time, or potentially even receiving a citation for staying too long at your meter. How many times have you wanted to try on that other pair of shoes or talk to a friend you bumped into on the street, but you had to go, cause your meter was almost up? Too many times! 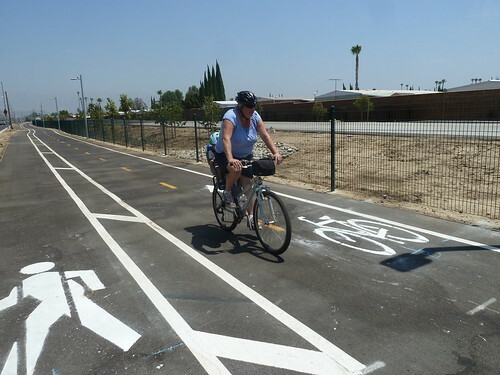 Bicycles are a liesurely way to shop and explore your neighborhood, making you more aware of what it has to offer, and potentially more receptive to spending time and money there. 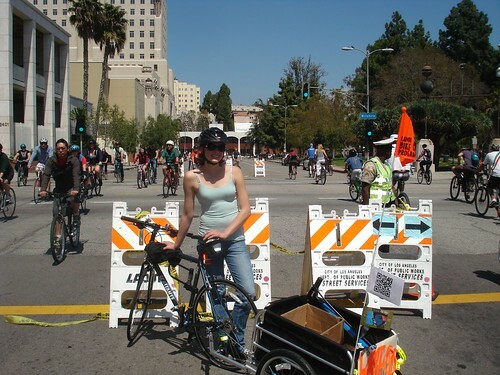 In some LA neighborhoods, LADOT has even installed Bicycle Corrals, where you can park your bicycle right in the middle of a busy shopping corridor just like your fellows driving cars. These perks are no small beans in a city where auto traffic is the norm and as mentioned before, finding parking can be tedious and frustrating. 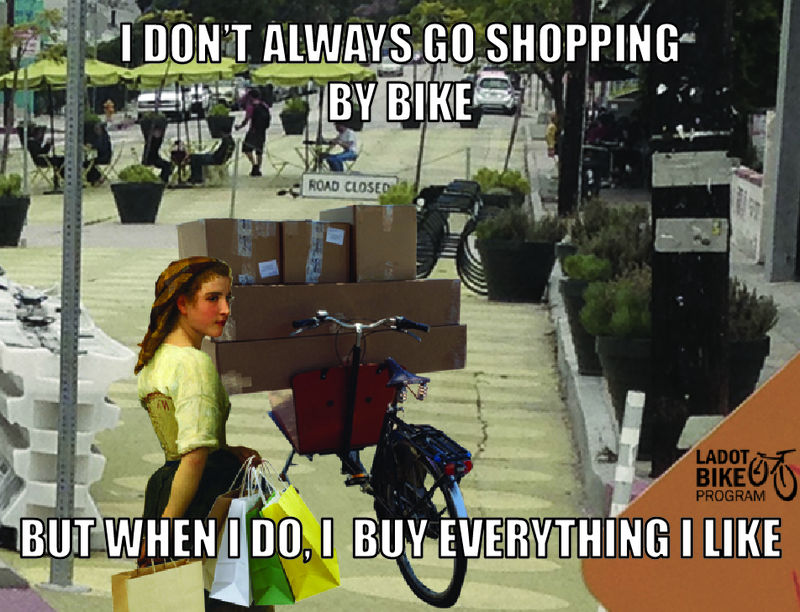 Plus, shopping on a bicycle is more efficient than walking and less cumbersome than carrying things onto the bus. 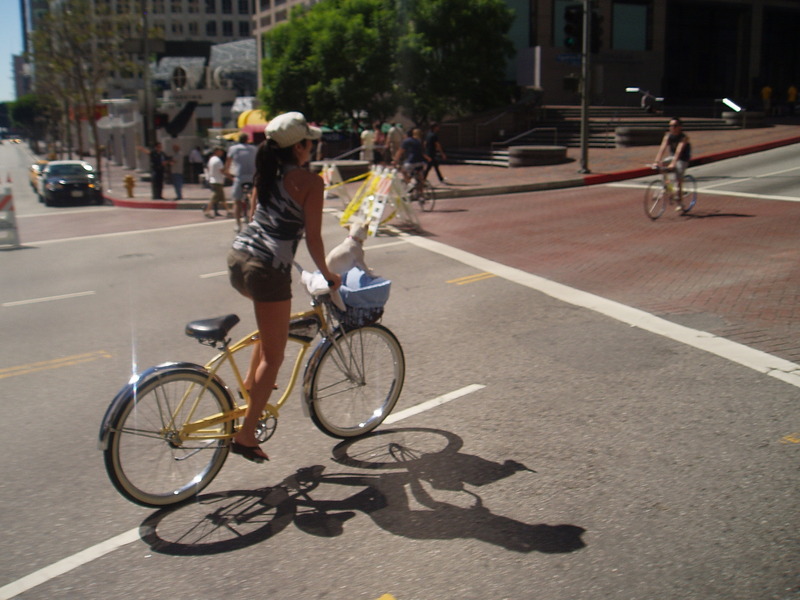 Because shopping by bike is super practical, doing so can easily be combined with your bike commute or leisurely ride around the neighborhood. SHOP – RIDE – NELA, led by C.I.C.L.E., will take place this Saturday December 13th, from 9:30am-12:30pm, with a ribbon cutting for the Colorado Bl Corral with Councilmember Jose Huizar at 12:30. 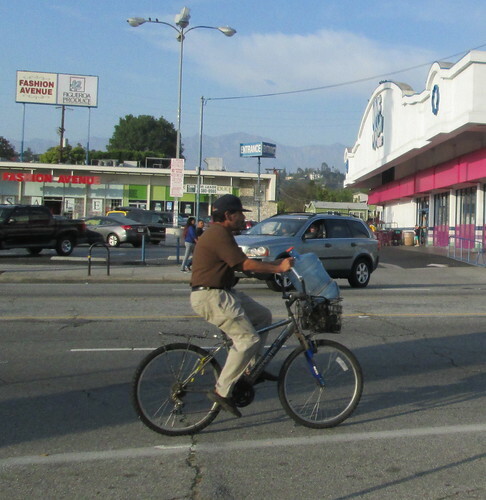 The ride will explore 3.6 miles of Northeast LA’s most vibrant shopping corridors. More details can be found in our recent blog post about the event. 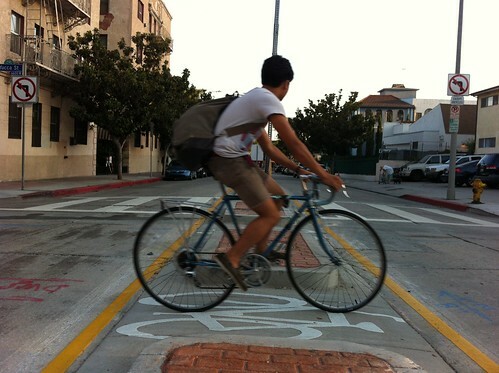 Backpacks are probably the simplest and most affordable way to haul your shopping items while bicycling. These are excellent for carrying small, lightweight loads, but be wary of heavy items and the “sweaty back” on hot days or long rides. Backpacks and messenger bags that are made by bicycle companies tend to be weather proof and highly durable, making sure your valuables are protected. Saddle, frame, or handlebar bags are excellent rackless options for storing small items and are very popular for holding commuter tools like tire levers, spare tubes, first aid kits, or other bare necessities. The frame and handlebar bags are especially useful for items that need to be easily reached like chapstick or your cell phone. If you choose to use your bike to do most of the work instead of your back, then you’ll need to add a rack to your bicycle. Racks serve a wide variety of purposes and can be attached to the front and/or rear depending on your bike and carrying needs. A rack is key because it provides a mount for panniers (bicycle mounted bags) as well as a platform on which to strap your goods. A simple bungee cord can be used with a rack to secure most objects, making racks one of the most necessary and effective ways of undertaking any shopping trip by bicycle. Racks also free you up from cumbersome bags that might cramp your style. Most local bike shops sell bike racks and they can be aquired for as little as $15. Items can be directly placed on top of a mounted rack without a bag or container by using secure straps or bungee cords. Baskets are great for carrying items that don’t need to be enclosed or carefully contained. 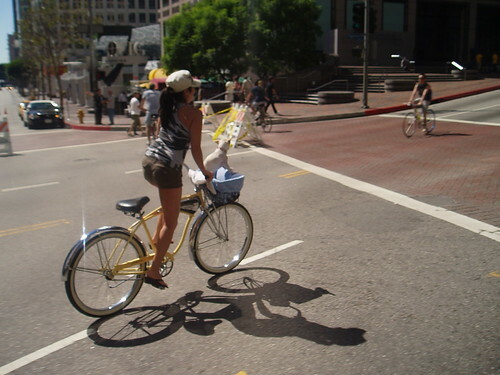 Generally, weight should be considered when using a basket, as heavy objects might affect your ability to steer your bicycle. Milk crates can serve as an affordable DIY basket. To use a milk crate, find one that is not too large for the rack and make sure to use a lot of zip ties to securely attach the crate to the rack. Be careful to not load up too much weight into the crate otherwise shifting weight might cause the zip ties to snap! 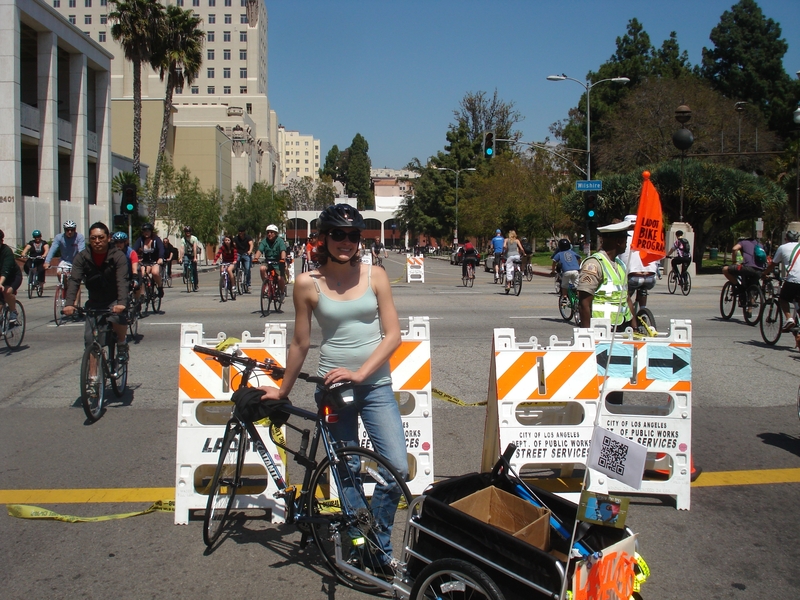 At CicLAvia, sometimes baskets are used to carry friends! Trunk bags are strapped on top of the rack and are built with non-collapsible walls that stand up on their own. Some trunk bags come with side pockets that can expand into small side panniers for extra storage. 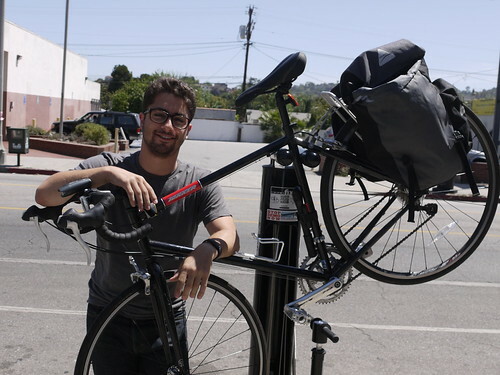 Panniers are bicycle-specific bags that attach to the rear or front rack. Most panniers work like saddle bags and carry 10-20 liters per bag. Panniers are a wonderful solution for large amounts of groceries. They are your ideal candidate for shopping, commuting, or bicycle touring and are often sold in pairs in order to balance your heavy loads. Panniers come in all forms and qualities- the more expensive versions contain special features like converting into a backpack, clip systems for easy removal, reflectivity, and all-weather proofing. Bicycle cargo trailers offer the largest storage capacity and can carry much bigger loads than the bicycle itself. Trailers normally attach to the bike frame, much like a tow hitch on a truck. Some trailers are even fashioned with a child seat inside so you can take your child with you while you shop! When you pack up your bags, try to distribute the weight as evenly as possible. This will make riding more comfortable and also prevent your bike from toppling over while you wait at stop signs or lights. Shop local and support businesses that embrace bicycle-friendly practices! 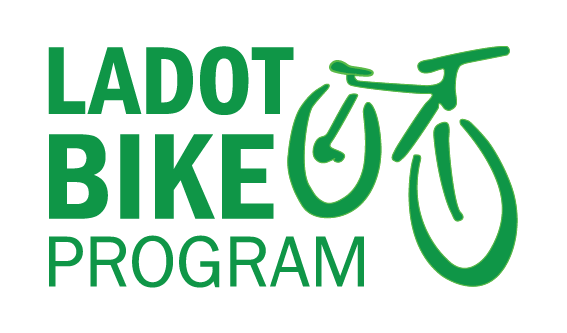 The Bike Program launched the Bicycle Friendly Business Program (BFB) earlier this year to promote businesses that encourage people to bicycle for short neighborhood trips and make their streets more pleasant and convivial places to be. For more information or to opt into the BFB Program, check out our BFB page and opt in form!